Frank Grzeszczak and Chany Sabates at International Yacht Collection write to say that their co-central agency for sale, the 52.8m motor yacht Latitude has had a substantial $3 million reduction in price. Latitude was built by Hitzler Schiffswerft in 1973 and in 2003 was rebuilt as an expedition yacht to Bureau Veritas classification. Accommodation in this superyacht is for 12 guests in a master suite with private balcony plus three doubles and two twins. 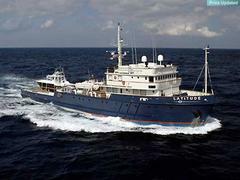 She carries 242,000 litres of fuel, sufficient for forty days at sea and comes complete with a 13m Mares sportsfisherman. Latitude is now asking $12.5 million.